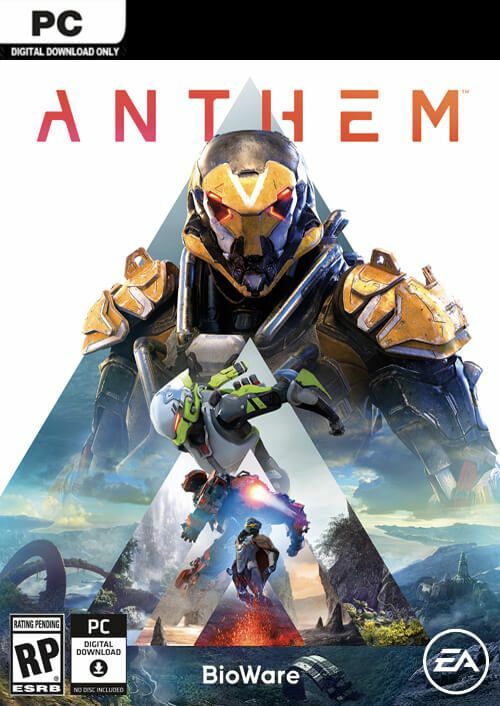 Anthem is a computer game in the genre of Action / RPG and a multiplayer third-person shooter with an open world. Anthem is a new post-apocalyptic fantastic game from BioWare. In a world that was abandoned during creation, humanity is struggling to survive in the wild, with many dangers. Freelancers, a faction of pilots of incredible Javelin exo-costumes, are eager to tilt the balance in favor of the people. In the beginning, the gods curbed the Anthem, the source of pure creation. And marvelous lands appeared, gigantic creatures, animals and monsters appeared. But before their work was completed, the gods left, leaving behind an unfinished world and their tools of creation. The power of the Anthem was no longer restrained by anyone, and world-changing cataclysms broke free, transforming and decomposing those who tried to master this force. Trying to survive, our ancestors created exocosuits, man-made armor, giving people super abilities. The world plunged into the eternal struggle between the power of the Anthem and the instruments of the gods that created it. Now the fate of humanity is in the hands of a small group of Javelin pilots, known as the Freelancers. In this open world, squads of up to four players set off on expeditions outside Fort Tarsis Fortress to meet and discover the many hidden secrets and unforeseen dangers lurking outside its borders. With the help of the exo-costume Javelin, freelancers can explore uncharted places from the air, on the ground and under water, and each costume is unique, containing its own style and combat role. By studying the outside world, freelancers can participate in large-scale world events, such as Shaper Storms, or face unforeseen dangers, such as wild beasts and ruthless marauders. Fort Tarsis serves as a gaming base where freelancers can interact with each other, upgrade their equipment and take on new quests. In the fort, the player can switch to the first-person mode, but battles outside the wall are fought solely from the third person. After activation, the game is bound to your Origin account.